Built upon decades of offroad racing victory, the Eibach PRO-TRUCK-LIFT combines a series of Pro-Lift-Kit springs and Pro-Truck Sport shocks to create a perfectly tuned suspension system engineered for both, on and off-road performance. Each PRO-TRUCK-LIFT is designed and tested to deliver maximum ride height without compromising the integrity of factory bushings, ball joints and other components. 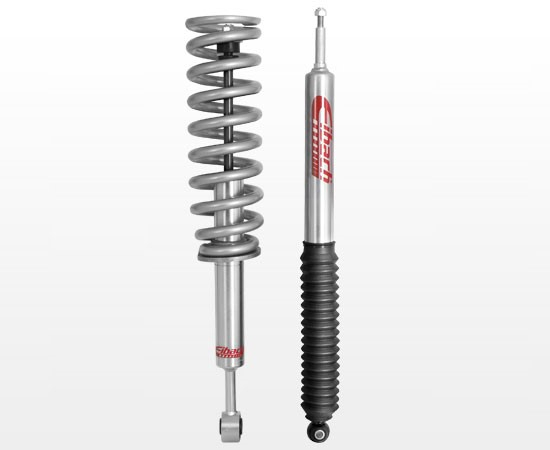 For vehicles with front coil-over-shock suspension, height adjustable spring perch grooves allow for fine tuning of the vehicles’ ride height. As winches, armor and accessories are added, this system maintains proper ride height allowing for more clearance and full use of available shock travel. With the same spring technology found in our ERO offroad race springs, the block resistant Pro-lift-kit springs can be taken to the limit mile after mile ensuring consistent performance and ride height. Matched with our heavy duty Pro-Truck Sport shock system, this combination is capable of handling anything in its path. Precision shock valving allows compliance over large obstacles and control through rough terrain while also improving on road comfort and performance.